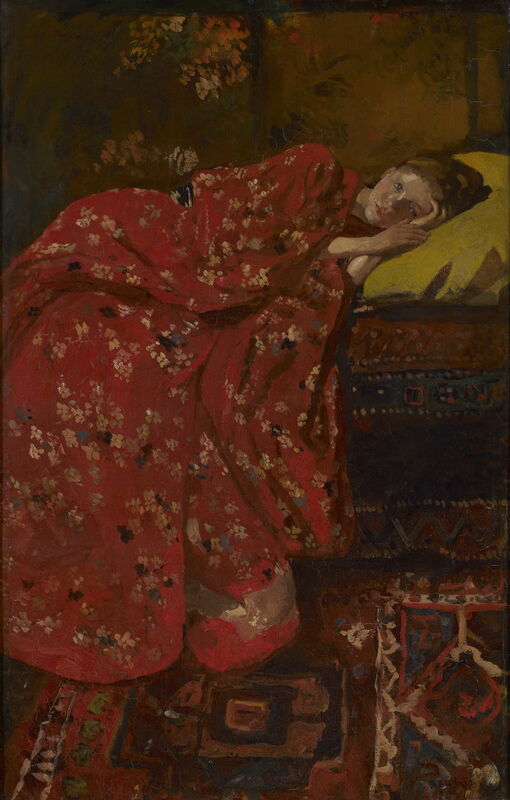 George Hendrik Breitner (1857–1923), Girl in a Red Kimono, Lying (Geesje Kwak) (1895-96), oil on canvas, 82 x 52.5 cm, Gemeentemuseum, The Hague, The Netherlands. Wikimedia Commons. In this second article about the Dutch Naturalist and Amsterdam Impressionist painter George Hendrik Breitner (1857–1923), I resume a small selection of his works from the mid 1890s, when he had an ardent enthusiasm for Japonism(e). George Hendrik Breitner (1857–1923), Girl in a Kimono (Geesje Kwak) in Breitner’s Studio on Lauriersgracht, Amsterdam (date not known), gelatin silver print, 31.1 x 38.7 cm, Collection RKD (Netherlands Institute for Art History), The Hague, The Netherlands. Wikimedia Commons. 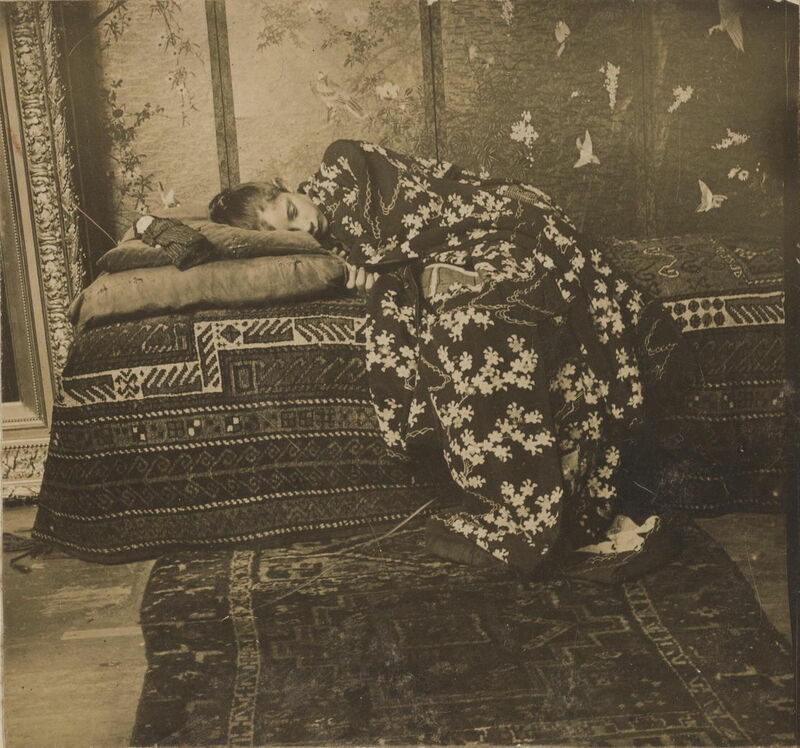 Between about 1893-96, Breitner took a large series of photographs of Geesje Kwak, one of his favourite models, wearing several different kimonos. Girl in a Kimono (Geesje Kwak) in Breitner’s Studio on Lauriersgracht, Amsterdam is an undated gelatin silver print from that series, which inspired a series of paintings. Girl in a Red Kimono, Lying (Geesje Kwak) (1895-96) is one of fourteen surviving paintings which he made from those photos and studio sessions with the model. For Breitner, photography didn’t replace conventional preparatory work, though, and he also made many drawings and sketches of these sessions. All fourteen known paintings, many of the photos and other material were shown together for the first time at the Rijksmuseum in Amsterdam in 2016. Breitner’s paintings remain among the most classical works of Japonism(e). 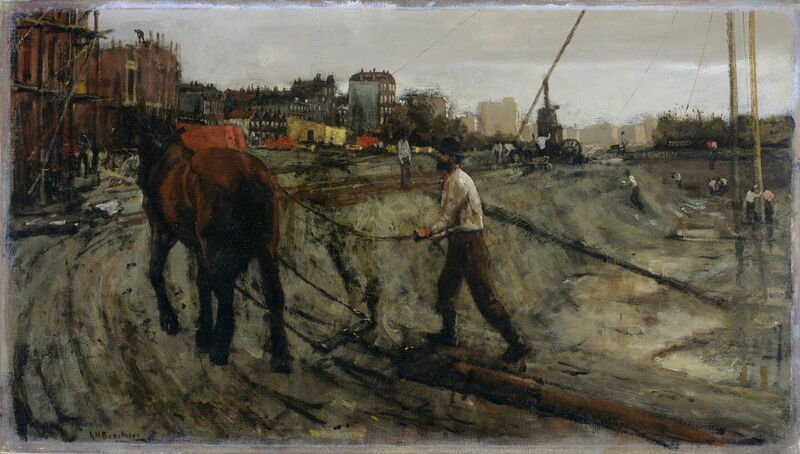 George Hendrik Breitner (1857–1923), Building Site in Amsterdam (after 1880), oil on canvas, 52 × 91 cm, Rijksmuseum Amsterdam, Amsterdam, The Netherlands. Wikimedia Commons. 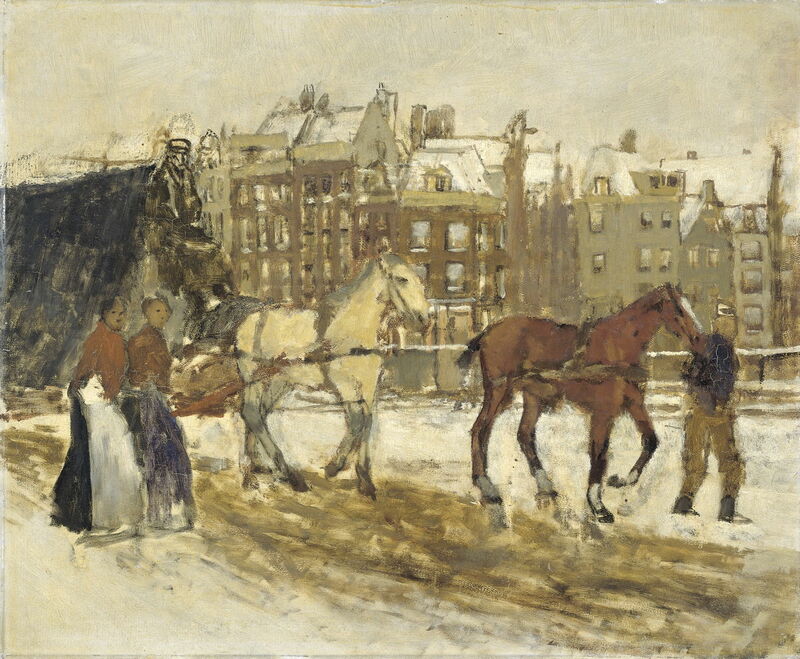 When in Amsterdam, Breitner continued his paintings of the common people, including those working on this Building Site in Amsterdam (after 1880). His plein air sketching was not confined to fine and sunny weather. One of the reasons that many of his paintings appear muted in colour is that so many were made outdoors when the sky was overcast. It has also been suggested that the sepias and dull colours used in contemporary monochrome photography were another influence. George Hendrik Breitner (1857–1923), Lunch Break at the Building Site in the Van Diemenstraat in Amsterdam (1896-1900), oil on canvas, 78 × 115 cm, Rijksmuseum Amsterdam, Amsterdam, The Netherlands. Wikimedia Commons. Lunch Break at the Building Site in the Van Diemenstraat in Amsterdam (1896-1900) seems to have been painted on a brighter day, as the workers sat outside during their short lunchtime. George Hendrik Breitner (1857–1923), The Singelbrug Near the Paleisstraat in Amsterdam (c 1897), media and dimensions not known, Rijksmuseum Amsterdam, Amsterdam, The Netherlands. Wikimedia Commons. 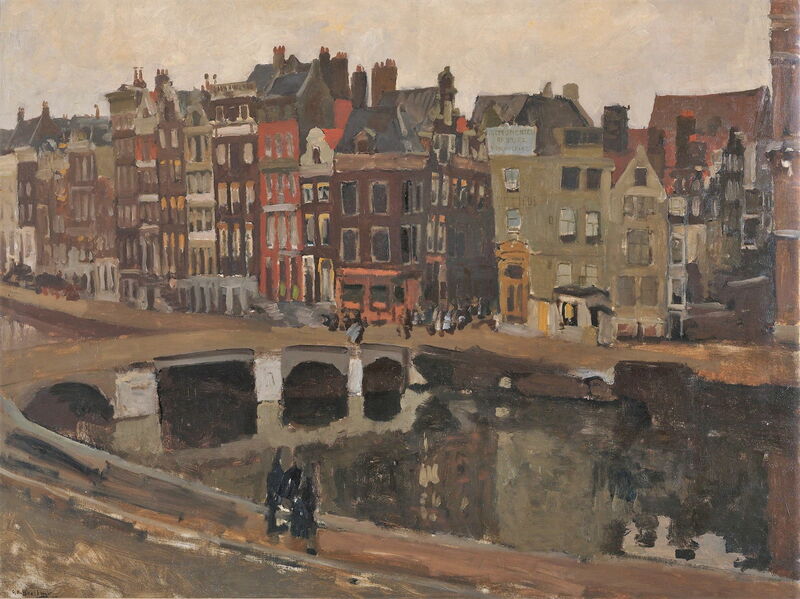 Breitner took hundreds if not thousands of photos of street scenes in Amsterdam, and made many paintings of them too. Among the best-known is The Singelbrug Near the Paleisstraat in Amsterdam (c 1897), which has the look of a photo, with those passing by frozen in their motion. George Hendrik Breitner (1857–1923), The Rokin in Amsterdam (1897), oil on canvas, 97 × 127 cm, Rijksmuseum Amsterdam, Amsterdam, The Netherlands. Wikimedia Commons. 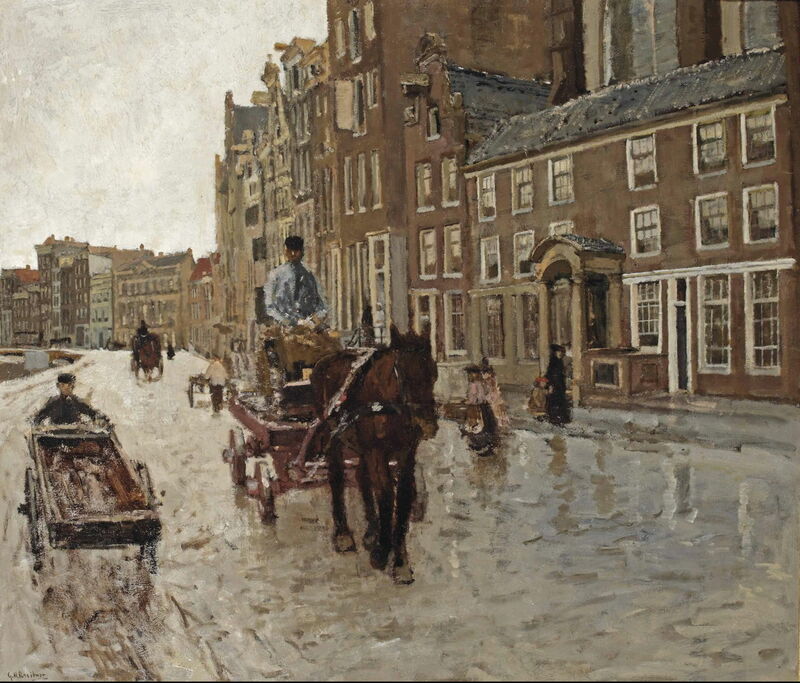 The Rokin in Amsterdam (1897) is a canal and street in the centre of the city which was a particular favourite of Breitner. George Hendrik Breitner (1857–1923), Promenade Deck with Three Ladies (c 1897), oil on canvas, 57 × 59 cm, Stedelijk Museum Amsterdam, Amsterdam, The Netherlands. Wikimedia Commons. 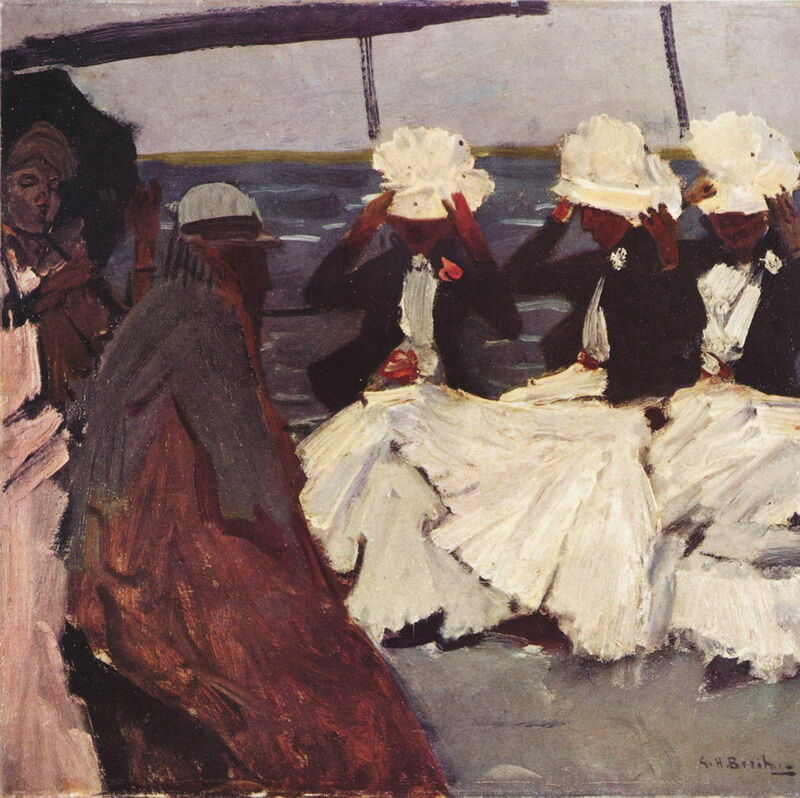 Promenade Deck with Three Ladies (c 1897) is another of his quick paintings apparently in front of the motif, here on the open deck of a ship off the coast. George Hendrik Breitner (1857–1923), Factory Girls (c 1898), media and dimensions not known, Kröller-Müller Museum, Otterlo, The Netherlands. Image by Szilas, via Wikimedia Commons. 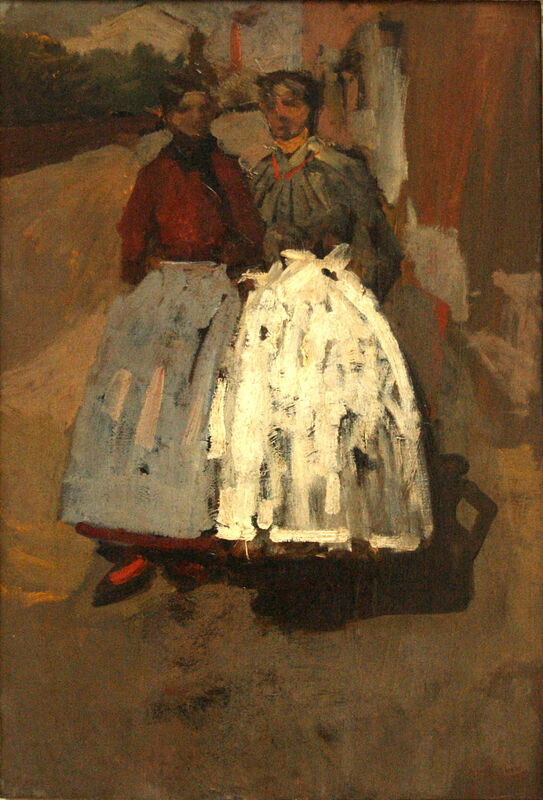 Breitner remained faithful to his original ideal of painting the common people, as in these Factory Girls (c 1898), even as he achieved fame in the Netherlands at the end of the nineteenth century. 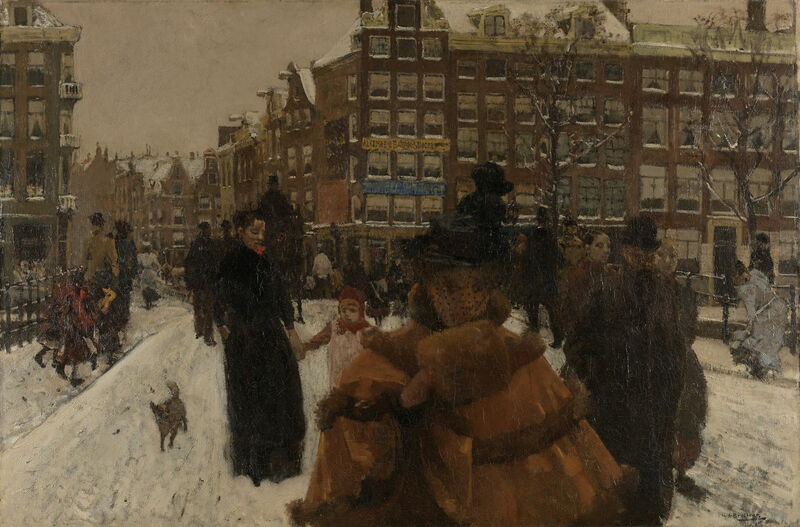 George Hendrik Breitner (1857–1923), Winter in Amsterdam (c 1900-01), oil on canvas, 95 x 192 cm, Rijksmuseum Amsterdam, Amsterdam, The Netherlands. Wikimedia Commons. 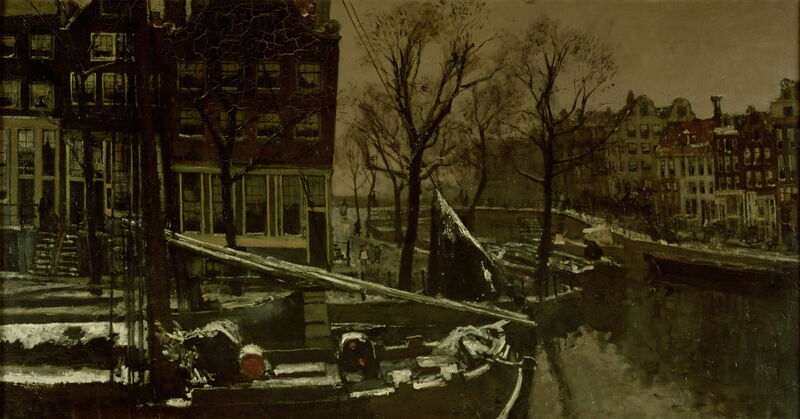 His Winter in Amsterdam (c 1900-01) is quite dark, as it would be on a typical overcast day during the middle of winter, but his snow highlights on the boat in the foreground give it an unusual effect of eerie stillness. George Hendrik Breitner (1857–1923), The Rokin with the Nieuwezijdskapel, Amsterdam (c 1904), oil on canvas, 81 x 70.5 cm, Private collection. Wikimedia Commons. Breitner relied quite heavily on photography when painting the city in rain and wet conditions, as in The Rokin with the Nieuwezijdskapel, Amsterdam (c 1904). During the early years of the twentieth century, Breitner enjoyed a highly successful retrospective exhibition (1901), and travelled more, visiting Paris, London, and Berlin. He also visited the USA in 1909. But the modernists were in the ascendant, and he refused to change his style to follow the trend. George Hendrik Breitner (1857–1923), The Rokin in Amsterdam (1923), oil on panel, 38 × 46 cm, Rijksmuseum Amsterdam, Amsterdam, The Netherlands. Wikimedia Commons. 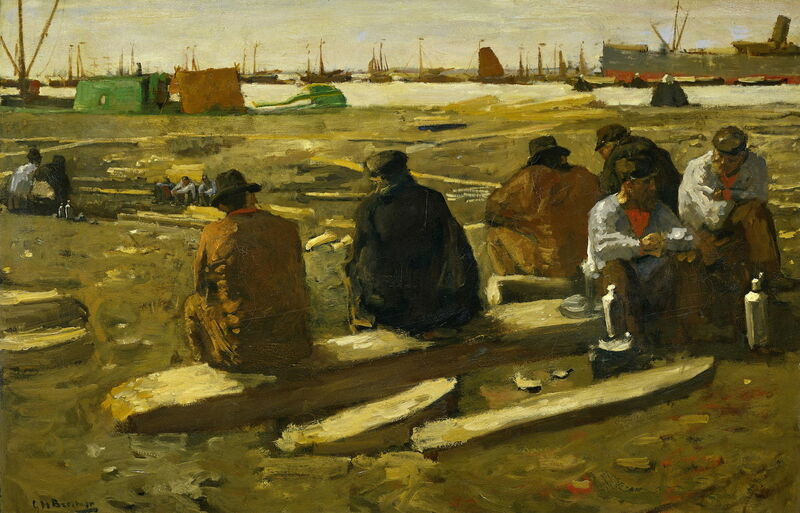 The Rokin in Amsterdam was painted in early 1923, and was probably one of his last works. He died in Amsterdam on 5 June 1923. Many of his photographs were not discovered until 1996, when it became clear how talented and innovative a photographer he was. Oddly, his reputation has largely remained confined to the Netherlands, despite his involvement in the career of Vincent van Gogh and his importance as a Naturalist, or social realist. Most appropriately, his name has entered the Dutch language, at least among those in Amsterdam, who still refer to dull and overcast weather as weer typisch Breitner Weer – typical Breitner weather again! Posted in General, Life, Painting and tagged Breitner, japonisme, landscape, Netherlands, painting, photography, van Gogh. Bookmark the permalink. What are all those hidden folders then?